What do you do when your child hits a road block? In short; allow a course correction. A parent’s flexibility with the plan, when necessary, will assist in keeping the child/teens enthusiasm high and foster continued momentum toward the child/teens goals. Hannah is a natural organizer and planner. Knowing when our date day was scheduled she immediately began charting our course. First, we would go to the printers to check prices on producing calendars, next craft supply store to price the production of greeting cards. Next we’d compare prices and make an informed decision about which direction to go. Lastly, we’d go to the mall for a beverage and just hang out chatting. No question, this sounded like a great date day to me. I marveled as I observed my ‘little girl.’ Clip board in hand, walking aisle to aisle, diligently searching for and marking down prices for the supplies needed to create her greeting cards. Shortly after she opens her little purse and pulls out a calculator. Feverishly punching in numbers a smile begins to appear. She looks up, eyes wide with excitement and says, “This is a better price for sure! What do you think Daddy?” She turns the clip board for me to see the total. With a sense of victory, we loaded the card-stock, envelopes, labels, and sticky patches for the photos into shopping cart and headed to check outs. Our date was completed by a trip to the mall and chatting over an iced tea. If you reflect on the sequence of events you will notice that I, as the parent coach, intentionally left responsibility with Hannah throughout this process. It would have been much simpler and quicker for Hannah, and I, if I had taken ‘control’ early in the process and said, “Calendars are going to be a bigger expense than you want to pay, why not focus on your greet card option.” Doing so would have robbed her of an incredible growth experience. She grew in confidence and ability with interpersonal communication, by speaking with the sales associate herself. She felt the pain of disappointment because we didn’t shelter her from that possibility. Something she will have to navigate the rest of her life. She learned to adapt, consider her other options midstream, so she could continue moving toward her original goal of making money for Christmas gifts. She grew in responsibility because she was allowed to carry responsibility on her own. By fostering this process we are allowing Hannah to build a reservoir of experience from which to draw wisdom when she leaves the shelter of our home. What other potential growth areas within Hannah do you see impacted by this simple experience? 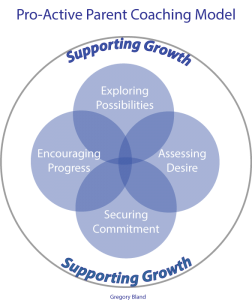 In what ways can you begin fostering growth in responsibility within your child/teen? In our next article we will look at Encouraging Progress when Hannah realizes she did not meet her overall goal. Keep an eye open for little ways in which you can release responsibility to your child/teen. *Gregory, Lynn, and family currently reside in beautiful Nova Scotia, Canada. Greg created the Pro-Active Parent Coaching Model, authored the book Pro-Active Parent Coaching: Capturing the Heart of Your Child, and offers training for parents who desire to connect with and empower their children through the discipline of Coaching. Greg strongly holds a conviction that as parents we are the best coaches for our children and teens. Currently Greg, Lynn, and family are providing pastoral care, participate in various speaking engagements, and offer coach training. For more information visit Pro-Active Parent Coaching or write to greg@pro-activeparentcoaching.com.